A sitting San Luis Obispo County supervisor seeking to keep her seat has dozens of campaign signs placed on county and state property in violation of the law. Typically, candidates get permission from supporters to place signs on private property. Campaign signs are not permitted on public lands such as parks or public right of ways like highway on-ramps. Last week, supporters of Supervisor Caren Ray placed campaign signs on public property spanning much of southern San Luis Obispo County, where her district is located. Ray, whom Governor Jerry Brown appointed last year to fill a vacant seat on the board of supervisors, is running for election against Nipomo businesswoman Lynn Compton and Arroyo Grande real estate broker Mike Byrd. The district encompasses all of Nipomo and Oceano and some of Arroyo Grande. Dozens of Ray’s signs popped up in strategic South County locations, including along Tefft Street in Old Town Nipomo, Willow Road on the Nipomo Mesa and Los Berros Road in rural Arroyo Grande. Ray supporters also attached her signs to freeway fencing and next to on and off-ramps, a violation of state regulations. Ray said Monday that her volunteers placed the signs in the public locations, and her campaign staff is deciding what to do about them. “Some of our volunteers, it appears, got a little over zealous, and we’re figuring out what to do with them right now,” Ray said. The state of California owns land adjacent to Highway 101 up and down the freeway, and Caltrans maintains the property. Caltrans spokesman Colin Jones said the agency has received a few complaints about political signs and that it would take down signs deemed in violation of the law. The county, however, controls most of the right of ways on which Ray’s signs have been wrongly placed. County transportation planner Glenn Marshall said the county’s public works department received three complaints about political signs, prompting him to send a worker out Monday to investigate. The county worker found that each of the three candidates had signs placed in right of ways, Marshall said. Compton said she never had any signs in right of ways. 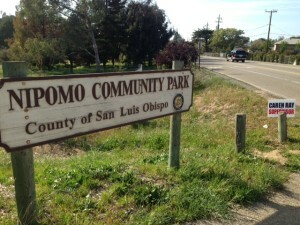 Byrd said he briefly had several signs placed in Nipomo right of ways. A supporter of his positioned them next to Ray’s signs thinking it was legal to do so, Byrd said. “When he saw all of Caren’s, he assumed, she being a supervisor, that they were all in legal places,” Byrd said. Less than a day later, the volunteer took down the signs, Byrd said. In the past, the county has rounded up numerous political signs placed in right of ways and stored them in its road maintenance yard. It has been common practice to do so, Marshall said. But, the county has made no indication yet that it plans to remove any of the signs currently standing in right of ways. On Monday, a public works employee sent an email to candidates reminding them of campaign sign regulations. Before removing signs, the county sends candidates three notifications of code violations, Marshall said. County code, however, only allows candidates to have signs standing in the 60 days leading up to the election, as well as the 14 days following. The 2014 primary election will take place on June 3. Some supporters of Compton allege that Marshall is using his position to aid the campaign of Ray. As a county supervisor, Ray is one of the highest ranking officials in the agency in which Marshall is employed. Marshall also serves as a member of the Grover Beach City Council. Last December, Marshall voted to boot Mayor Debbie Peterson from the county air pollution control district board after receiving pressure to do so from Supervisor Adam Hill, a close ally of Ray’s. Marshall said he does not support candidates. 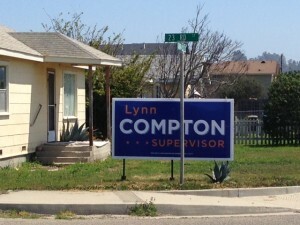 While the county has not pressed the issue, many Compton signs also appear to violate code. A section of the county code restricts the size of signs placed in urban areas of unincorporated communities like Nipomo and Oceano. The code limits sign sizes to four square feet in residential areas and 16 square feet in commercial areas of those towns. Compton has numerous 32-square-foot signs, many of which are in core areas of Oceano. She said she would take the signs down if the county deems them out of compliance with code. Marshall said the county has not investigated political sign sizes this election season. Critics of Compton have also accused her of violating a little known state law restricting the placement of signs near highways. The code prohibits the placement of campaign signs within 660 of landscaped sections of freeways. However, no area of Highway 101 in San Luis Obispo County south of the Arroyo Grande Village is designated a landscaped section, according to Caltrans. Morro Bays mayoral race is getting off to a nasty start with Carla Borchard Wixom leading the way. Her slogan, bring Morro Bay together, is a line of B.S. that she obviously has no interest in following and has NEVER practiced. One of Carla’s main supporters, Kathleen Wells, openly boasted to Carla’s Facebook page, that Kathleen’s husband is taking down, (stealing) Jamie Irons signs. Carla’s Facebook page is open to the public. What is Mrs. Wixom’s response to this illegal theft ??? Does she condemn or distance herself from idiot Wells? Why no, instead she offers Kathleen more of her campaign signs. This is the real Carla Wixom folks. She did not respond by asking Kathleen Wells to stop this asinine juvenile and illegal destruction of signs. This folks, is Carla’s idea of bringing Morro Bay together. Carla’s true colors and lack of leadership are apparent. ***The following is cut and pasted directly from Carla Wixoms Facebook page. It was posted on April 6th from Kathleen Wells to Carla and is still there now, as of April 23, 7:30pm. Reflecting on past elections Irons and his lil boys try to put signs up there but Billy takes them down on his daily drive in the morning. If you give me a bunch Carla….I KNOW the great spots. Billy comes along with me with a nail gun or a better apparatus to make sure the signs STAY where we put them. ~~~~~Just sayin~~~~~~: ) I think you need to be more the assertive with Irons and his crew. ; ) In addition if you have N Johnson’s signs and Headding…….we need a BUNCH. Carla responds to Kathleen Wells by offering her more Carla signs and saying thank you! Look for yourself and remember ….this is someone who wants to be mayor? Not only does this show Carla cannot conduct herself in a professional demeanor, she’s not even smart enough to pretend to distance herself from her morally bankrupt stooges. Hey Diamond…..you forgot to mention that that statement was in regards to the election 2 years ago when Yates was running, and the signs that were removed were on one particular piece of PRIVATE property that Irons minions were posting without permission. By the way what ever happened to your videos………we all still need a good laugh! No, it wasn’t in regard to the election 2 years ago. That was the emergency cover story cooked up when the Facebook posting was discovered and publicized. Check out a regular column in a small local print and online newspaper that came out today – no not the Bay Snooze. The other one. The column is titled, “A Nut’s a Nut”. Ok I read it AGAIN……..she was referring to “Reg’s” property…..so how does that constitute taking signs down all over town? One piece of property is NOT all over town. I read the initial posting. Am not impressed with a newspaper calling people names and take their story with a grain of salt. PERIOD. Oh yeah Diamond….you also forgot to cut and paste the complete sentence which comes prior to “reflecting on past elections” I went on FB to read it myself and you conveniently forgot to post the part where she was speaking of a friends private property in relation to this post. Its NO WONDER why all your hysteria over your crap never went ANYWHERE. Spin it anyway you like, it’s there for the public to see as candidate Carla chose not remove the boast from her public Facebook page or distance herself from the illegal acts of her self appointed poster Sherriff. It reflects on who she is, her real character. Your limp attempt to make excuses for Kathleen Wells, is what it is, another excuse for poor moral conduct. Very old guard. This must be the “new” Carla’s Wixom, “bringing Morro Bay together” because the OLD Carla Borchard was voted out! Thank you MB activist. The cover up by candidate Carla, so early on over something so simple. Carla failed to do the morally correct thing by asking Wells to not vandalize other candidates signs. This speaks volumes about Carla. My videos? What are you talking about? Your spin cycle must be drinking along with you. Try getting your fun facts right. Apparently your so busy attacking so many people, you get them confused. I guess that’s to be expected at your age. If you need a good laugh, repeat Carla’s campaign slogan, trying to bring Morro Bay together. That’s a good one hahahaha! givemeabreak, If it was from 2 years ago then why is Wells asking Carla for Nancy Johnson signs at the same time???? Nancy didn’t run two years ago. Do the math. Your attempt to help cover bad behavior is just embarrassing. Your lies are lying. Sad…. LOL, and so the campaign sign battle begins. I’m reminded of the year that someone took down over 400 of George Luna’s signs here in A-Town. Fortunately, the ‘law breakers’ threw all the signs into a field and most were recovered and reinstalled. In the mean time, Luna;s wife had placed a rush order for 300 new signs prior to recovering the stolen signs. He ended up with a load of signs and won by a land slide but he would have won regardless of the signs. Such is not the case with these unknown candidates and this ‘wet behind ears’ appointed encumbent. Carry on and try to convince us that you’re the professionals that ‘some of you’ AREN’T. Unlike Luna, you need your signs. Do it right. So it would seem that so anti-Ray people have decided to take the low road with numerous signs on private property being removed or run over by vehicles. I think some do not understand that right of way varies and often crosses onto private property although it’s hard to understand how someone feels it’s acceptable to remove signs on a property owners side of a fence. I heard the same for Ms. Compton signs, being accidentally damaged or mysteriously removed, but since neither of us have given proof for either, maybe a police report filed, pictures or such both statements seem as desperate attempts to garner support. Pictures of signs not being there, hmm seems pointless. I was thinking more along the lines of pictures of someone from the others organization removing a sign, or as I stated a files police report. Well one case seems rather unlikely and the other a waste of time and public safety resources. While you may have heard of some cases, my comments are no hearsay, I have observed signs missing and run over. Oh that’s right, you were the one promoting sniping signs in an earlier post. It all seems clear now. If ANY of these candidates win the election based on SIGNS then we are in big trouble! 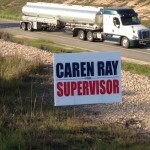 It seems like Caren Ray has people work on her behalf yet does not supervise what they do. Then, when they do something that is unethical, she does not take responsibility for the actions. I started out neutral/wait-and-see for Caren Ray, but that has changed. I “waited and saw,” and I don’t like what I see. Awh, Mary, Mary, something deep inside me says you were never neutral about Caren:(( It’s very sad when you wait and ponce on a person for the first little infraction you can find. Why haven’t you pounced on Lynn Compton for her oversized signs and oh, by the way, Mike hasn’t taken down his signs that he said were all placed by Caren’s (NOT! )…pounce on him, too! Hardly the first infraction for Ms. Ray, there have been many, this is just the latest. Of course many of her infractions are actually non-statements of issues and/or when her fellow supervisors so something wrong and she refuses to make any statements or separate herself from their form of government. The saying goes if it walks like a duck and talks like a duck, Then it is a Hill, I mean duck. A volunteer, believing Ms. Ray’s signs were legal, placed some of mine next to hers Sunday afternoon. Within an hour of my learning about them Monday morning they were removed. If you are aware of any other of my signs inappropriately placed, please give me the location(s) and they will be removed immediately. You may call or text me directly at 441-5133. All candidates received a copy of the ordinance concerning campaign signs when we took out our papers. I actually read it and it has always been my intention to comply. It takes up to two weeks for the county to force compliance which means that those who fail to follow the rules get two weeks extra exposure at high-visibility locations. That’s interesting since Byrd did the same thing except one worse and just followed an ignorant volunteer. Then there is Compton who said she will take signs down when told to not caring if they are legal or not. And you see Ray as The one you have issues with? Gee, I wonder who complained. 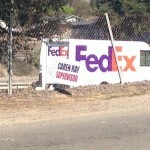 Hint: Lynn Compton driving her hyper-expensive super-sized SIGNMOBILE was spotted Saturday morning on Willow in Nipomo photographing Caren Ray’s signs. CCN didn’t even have to hire their own photographer to do this hit piece. Good to have media connection, ah, Lynn? I really do not think what the candidates drive has anything to do with it. Hyper-expensive, so what. Super-sized? it’s not your place to decide who drives what. large or small, who cares? It’s almost like your judging all who drive something bigger than you would like! Don’t even get me started about that behemoth sign-mobile. Anybody who has so little regard for public spaces is very unlikely to be considerate to her constituents. Vote for her this, don’t do that, can’t you read the sign? Vote for her, can’t you read the sign? You’re a friend until the end…. I’m sure she’ll take them down.